I have tried for another loose, Classic style here. 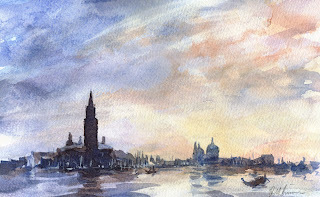 Venice is such a popular subject, easy to tell why, water and old buildings. I imagined the small gondola, now I realise that in the bay his pole would not be long enough! (Duh) Ah well, I will have to re-apply for my Artistic License.